April 3, 2011, St. Cloud, Minnesota - It’s no surprise that having a loved one who serves in the military is stressful. The uncertainty that builds during the time friends and family spend apart from them can be agonizing. Dan Shannon wants to change that. That’s what brought Shannon, the president and founder of Operation Homelink, to the St. Cloud National Guard Training and Community Center on Sunday afternoon. The Chicago-based nonprofit organization is on a mission to provide refurbished computers to families of deployed soldiers. It worked with the Beyond the Yellow Ribbon Family Programs team to present the computers. “It’s just nice to see that they’re trying to keep the soldiers connected to the families,” said Sarah Imdieke, 23, of Sauk Centre, “to have that little piece of home with (us) while we’re gone for such a long a period of time ... that’s wonderful.” At Sunday’s event, 150 desktop computers were given to families with members in the 34th Infantry Division Brigade Combat Team. Shannon said his inspiration for starting the project came almost a year after Sept. 11 and watching images of soldiers being deployed to serve their country. “Seeing a father saying goodbye to his wife and kids, as a father of four myself, really hit home with me,” he said. “Because I’ve not served myself, I wanted to do something to give a little something back.” Shannon isn’t alone. 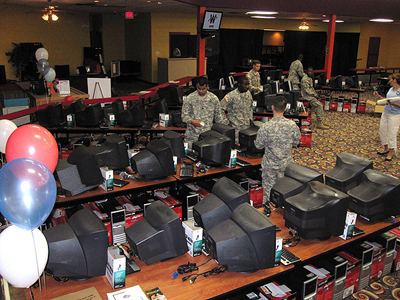 The computers given away Sunday came from a Massachusetts-based company called Raytheon, which already had donated 110 refurbished computers to families of the Massachusetts National Guard. Microsoft donates free software updates for the machines and all the work in setting up the event Sunday was done by volunteers. “Everything was 100 percent volunteer-driven,” said Sgt. Amy Monson, family programs noncommissioned officer in charge for the state of Minnesota. All that effort wasn’t lost on Diane Imdieke. “I think it’s going to make a world of difference,” she said. “It’s huge ... in today’s age, it’s instant communication instead of waiting for a letter back and forth,” Monson said. “And the soldiers feel that connection with their family because they know that yesterday (something) happened instead of three weeks ago (something) happened.” And that’s exactly the point, Shannon said. Seeing families walk away with something that he knows will make a world of difference makes all the hard work worth it, he said. 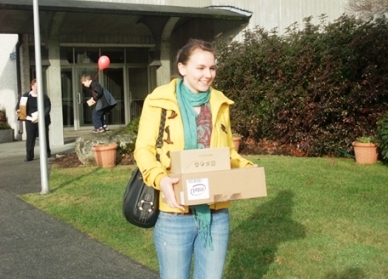 But Shannon also was quick to note that Operation Homelink is more than just a giveaway. April 3, 2011, St. Cloud, Minnesota - The levels of technology for troops in Iraq and Afghanistan have risen exponentially since the beginning of the wars. Internet access is common -- if not always reliable -- and on most bases Skype software has allowed service members to keep connected through phone calls and video connections like never before. That's why it's so important to have a good computer back home. Last week 150 families of deploying members of the Minnesota National Guard were the recipients of refurbished computers through a Chicago-based nonprofit called Operation Homelink. 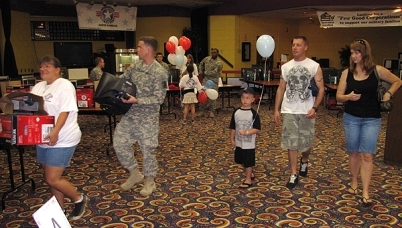 The group has provided computers to more than 3,500 military families since it began in February 2003. The most recent donation came from Massachusetts-based defense contractor Raytheon Co. and was coordinated by the Guard's Beyond the Yellow Ribbon Family Program. Members of the 2nd Battalion, 135th Infantry are scheduled to deploy in May for the Middle East in support of Operation New Dawn, the drawdown of troops in Iraq. PFC Sarah Imdieke will be leaving family behind in Sauk Centre on her first deployment in five years in the Guard. The new computer will allow her mom, Diane, to keep in touch. The family's old computer was on its last legs and didn't have video capability. "We wouldn't have been able to see her while she's gone," Diane Imdieke said. "It's huge, hopefully it will take away a lot of stress and worries. You can write a lot of stuff in a letter and say something in a phone call but when you can see that they look healthy and not all stressed out it will say a lot more." Operation Homelink is always looking for companies to make a donation of at least 50 computers with a minimum of Pentium III 1.8 Ghz. The donation is tax-deductible. The program also keeps computers out of landfills. Fort Bragg, NC, August 5, 2010 – Today, Operation Homelink and Operation Homefront-North Carolina, in collaboration with the Raytheon Company presented 110 refurbished computers to the families of junior-enlisted soldiers stationed at Fort Bragg. All computers were distributed today at the Yntema Club on post. “You don’t realize how your whole world changes without a computer until you don’t have it anymore”, said Ashley Adolf, whose husband Chris Adolf, Staff Sgt. with Alpha Troop 3-73 Cav, returned from his 12-month deployment just hours before coming to pick up their computer. After explaining that their home computer had crashed two months earlier, Chris added , “she was calling me in Iraq to research things on the internet. I had a better connection to the world than she did. This program is a great. Please keep up what you are doing”. While most service members have access to e-mail while deployed including sites throughout Iraq and Afghanistan, the situation is often different for their families back home. 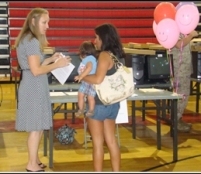 Troops rely on correspondence from family members during demanding deployments, but the families of many junior enlisted members are often not able to afford computers and must rely on conventional mail or expensive phone calls to stay in touch. The computers were donated by Waltham, Massachusetts-based Raytheon Company, while the new printers were provided by Lexmark and webcams by Logitech. “The webcams are a great because now my kids can see and hear their daddy. You have no idea how important that is” said Amanda Lafler, wife of Sgt. Jared Lafler, who is deployed with the 261st MMB. “Operation Homefront was thrilled to team up with Operation Homelink to bring computers, printers & webcams to those service members and their families here in the Fort Bragg community”, added Tracy Curran, military spouse and Community Representative for Operation Homefront of North Carolina. “We are very appreciative of the support from Raytheon, Lexmark and Logitech in our mission to connect military families with deployed loved ones, said Dan Shannon, founder and president of Operation Homelink. To date, OHL has distributed over 1,100 Raytheon computers to military families and wounded service members located across the U.S. "We congratulate Operation Homelink for its efforts to help families and deployed soldiers stay connected," said Rebecca Rhoads, vice president and chief information officer, Raytheon Company. "Raytheon shares the commitment to our heroic men and women in uniform and their families. Operation Homelink provides a way for us to combine high tech with high touch for a very worthy cause." Fort Lewis, Washington– December 18th, 2009 – Some military families are celebrating Christmas early this year with a special gift. One hundred families of soldiers are getting brand new laptop computers equipped with Web cams to help them stay in touch with their loved ones serving overseas. Robert Keane's wife, Brandy, is serving in Kuwait. The family's computer crashed just as the three Keane children were adjusting to their mother's deployment. Their new laptop will now shorten the distance between them and her. "They can see her again, twice a day," said Keane. "It's important for them. I've got a 3 year old, a 4 year old and a 7 year old, and they miss their mother a lot." 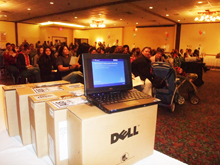 The Dell corporation donated the computers and Microsoft donated the software. The laptops are distributed by Operation Homelink, a the civilian nonprofit group founded by Dan Shannon five years ago. The computers are going to families of junior enlisted soldiers -- the privates and specialists. Marlia Kegler and her three children are trying to cope with Pfc. Brian Kegler's first deployment. The father and husband is in Afghanistan with the 5th Stryker brigade. Marlia Kegler says the laptop will be especially helpful for her daughter. "She pretty much just asks where he is everyday, and lately she's (saying), 'I want my daddy. So this will be a very good chance for her to see him." They can't hug their loved ones, but at least they can stay in touch. A nonprofit organization has made this Christmas a merrier one for families of deployed Fort Lewis soldiers. Operation Homelink of Chicago presented more than 100 new netbook computers donated by computer manufacturer Dell to the families. The computers were distributed at the Army post last week. It was the first time the organization had visited Fort Lewis and the first time it presented computers with webcams. Operation Homelink, founded in 2003, note that can be a different story for the families of junior enlisted soldiers. They often can’t afford computers and must rely on the expensive phones or mailed letters to stay in touch. The organization is working to change that by distributing laptop and netbook computers donated by large companies to these families. Officials estimate that the company has linked 3,200 families to their loved ones overseas. “Having this computer is a huge blessing,” Patricia Owens-Hailey said in a news release. Volunteer soldiers assist Emylee Sosa and two-year old daughter Heiress in picking up one of 150 computers distributed to families of soldiers stationed at Fort Benning, GA and with the Georgia National Guard on December 12th, 2009. 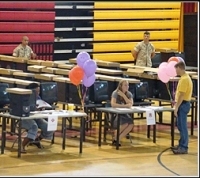 Spouses and parents of soldiers stationed at Fort Benning or with the Georgia National Guard received 150 donated computers today at the Kelley Hill Recreation Center, Fort Benning, GA. 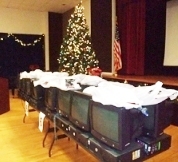 The computers were donated by the Raytheon Company and bring to 3,100, the numbers of computers that non-profit Operation Homelink has donated to military families across the U.S. over the last seven years. Shannon, who helped distribute the computers at Fort Benning, said his organization receives donated computers from corporations and then gives them to military families all over the country. The goal is to make sure deployed soldiers can stay in contact via e-mail with family members. He said this was the organization’s first trip to Fort Benning, but he hopes to return. 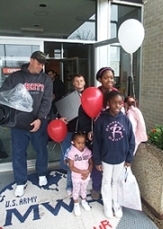 The computers presented Saturday were donated by Raytheon, a Massachusetts-based technology company. Shannon said the computers from his organization usually do not have Web cam capabilities, but because several people mentioned wanting to see their solider at Christmas they decided to get Web cams. The cameras will be mailed out to families next week. “So they will be able to see their solider at Christmas time,” he said. Homelink was started seven years ago and in that time has given 3,100 computers to families. Shannon said it all started when he would see images of those called to serve. “I couldn’t imagine what it would be like to be in those shoes,” he said. “I owe a debt to those soldiers and their families that I can never repay. Camp LeJeune, NC – August 8th, 2009 – Operation Homelink™, an all-volunteer, non-profit organization, in collaboration with the Raytheon Company presented 100 refurbished computers to the families of the II Marine Expeditionary Force (II MEF) stationed at Camp LeJeune, NC. Troops rely on correspondence from family members during demanding deployments, but the families of many junior enlisted members are often not able to afford computers and must rely on conventional mail or expensive phone calls to stay in touch. Operation Homelink strives to link American service members deployed overseas with their families through e-mail communication by re-utilizing refurbished computers donated by sponsors such as Raytheon. “During the fight, the most important is to be able to communicate with home, said Cpl. Marcus Keyes of the 2nd Maintenance Battalion/2MLG.“By adding a webcam it will mean everything for my two-year old son to be able to see his Daddy’s face”. Sgt. Major C. R. Green of the II Marine Expedition Force added, “this program provides tremendous benefits to our Marines and their families. It means a lot”. “Raytheon has been a tremendously supportive partner in our effort to connect our deserving military families with their loved one serving overseas said Dan Shannon, founder and president of Operation Homelink.